Nestling on the eastern coast along the blue waters of the Bay of Bengal the unique State of Odisha offers to her guests a ‘tourism capsule’ containing magnificent temples, sunny beaches, colourful wildlife, traditional tribal culture and a rich heritage. To her credit, it has housed the important pilgrimage center for the Hindus – Puri, the 13th century magic carved on sand stone – Konark, the largest brackish water lake of the continent – Chilika, the wonder greenland of the white tigers – Nandankanan, and many more caves, Chaityas, Stupas. temples, forts and palaces. 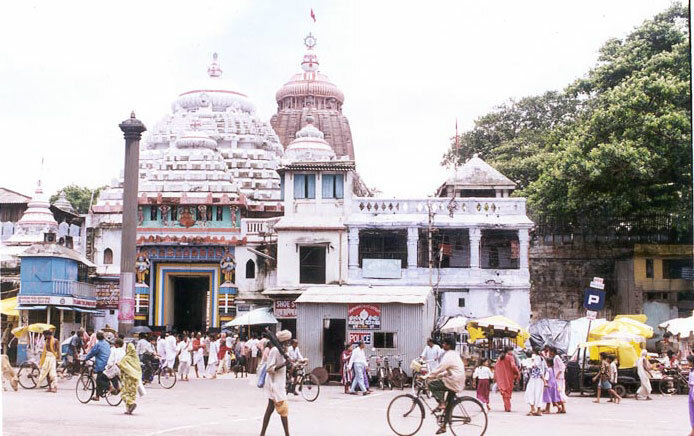 Statistics suggests,most of the visitors frequent this place for Lord Jagannath Temple and the blue bay. While several temples have vanished or have declined in importance, the great temple of Lord Jagannath at Puri is still a living and vibrant temple. Over the centuries it has attracted kings, conquerers, religious teachers, devotees and pilgrims. In the minds of the millions of Indians, Orissa is the land of Jagannath. 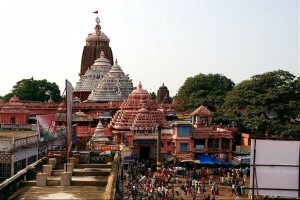 This temple of Lord Jagannath [‘Lord of the Universe’] at Puri is one of the most sacred pilgrimage spots in India, one of the four abodes [dhamas] of the divine that lie on the four directions of the compass. Lord Jagannath, the symbol of universal love and brotherhood is worshipped in the Temple along with Balabhadra, Subhadra, Sudarshan, Madhaba, Sridevi and Bhudevi on the Ratnabedi or the bejewelled platform. The Deities, Lord Jagannath, Balabhadra, Subhadra and Chakra Sudarshan are made of margosa wood. When one lunar month of Ashadha is followed by another lunar month of Aashadha, the deities change their bodies during such a leap month. This is known as Navakalebar or New Body Ceremony. Last four new body ceremonies of the Lords were celebrated in the year 1950, 1969, 1977 and 1996. 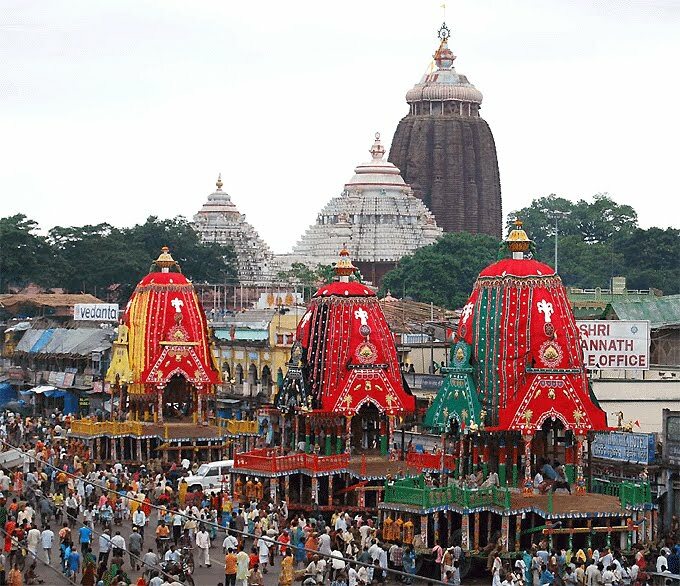 On such occasions, Puri witnesses the largest crowd in her fold. The Deities are adorned with cotton and silk fabrics, Gold Ornaments studded with precious stones, flowers of different varieties, Tulsi leaves, sandal paste, camphor. These articles are used in the daily and periodical rituals. Some important Veshas or costumes of the deities are mentioned below. This Vesha is done everyday after Mangal Aarati for the Abakash rituals. The clothes which are worn by the deities for this purpose are known as “Tadapa” and “Uttariya”. This Vesha are the normal costumes of deities which they wear five times in a day, especially after each food offering. This Vesha comprises silken clothes and flower garlands. This the last Vesha of the deities done everyday before the night “Pahuda”. Bada Sringar Vesha is mostly of flowers of different colours and species. The deities wear silk clothes called ‘Khandua’. This vesha is done for 42 days starting from Akshayya Tritiya day. On the full moon day in the month of Jyestha, after the bathing ceremony is over, the deities are dressed like elephants. Lord Jagannath and Lord Balabhadra appear like Ganesh[the Elephant God]. On the 11th day in the bright fortnight of Ashada, Suna Vesha takes place, when the deities are in their respective chariots near the Lion’s gate of Sree Jagannath temple. The deities are decorated with many gold ornaments. This vesha is also known as ‘Bada Tadhau’ vesha and Raja Vesha is also done on Dashahara, Kartik Purnima,Pousha purnima and Dola purnima. It is done on the 10th day of the dark fortnight of Bhadraba. The deities are dressed as if going for a picnic, like cowherd boys. On the 11th day of the dark fortnight of Bhadraba, Lord JAGANNATH is dressed like Lord Krishna killing the Kaliya Serpent. It is done on the 12th day of the dark fortnight of Bhadraba[September], Lord Balabhadra’s killing of the demon Pralambasura is depicted in this Vesha. This Vesha is done on the 13th day of the dark fortnight of Bhadraba. 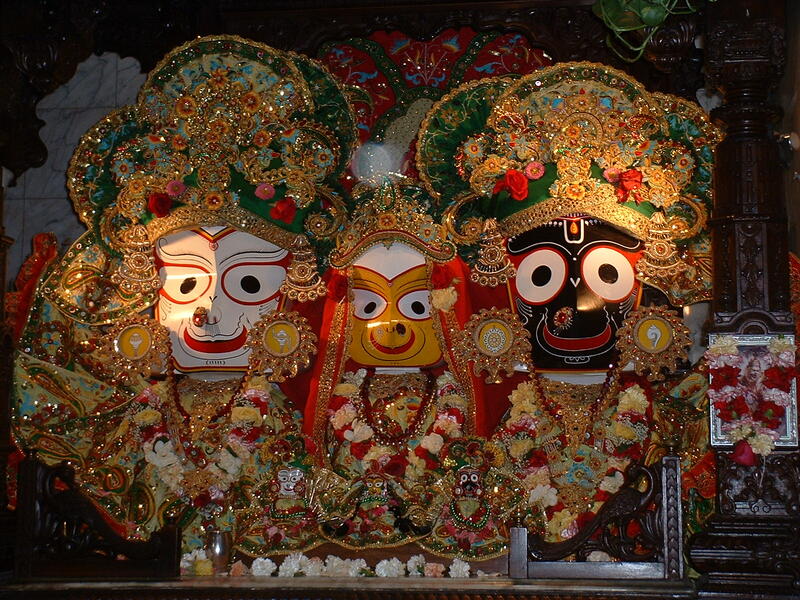 Lord Jagannath and Balabhadra are dressed like Lord Krishna and Balaram. 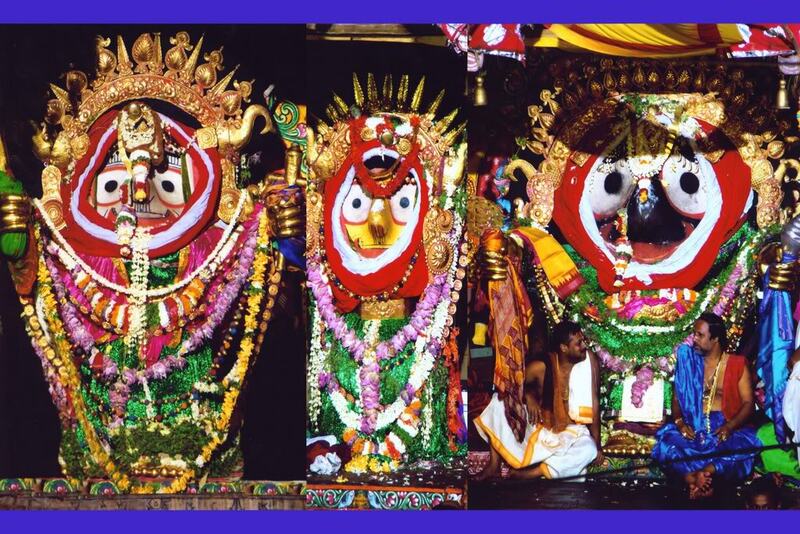 On the 12th day of the bright fortnight of Bhadraba, Lord Jagannath is dressed like “Bamana”[dwarf]. Bamana is the fifth incarnation of Lord Vishnu. From the 11th day of the bright fortnight of Ashwina to the 10th day of the bright fortnight of Kartika, this vesha takes place. It is done on the 11th day of the bright fortnight of Kartika. It is done on the 12th day of the bright fortnight of Kartika. This is done on the 13th day of the bright fortnight of Kartika. On the 14th day of the bright fortnight of Kartika, this is also known as Laxmi-Nrisimha Vesha. This vesha is occasionally done in the month of Kartika, when there are six days of “Panchaka”. The lords are dressed like warriors. In the recent past, this besha has been done on 16.11.1994. The previous four dates were 26.11.1993, 3.11.1968, 16.11.1967 and 26.11.1966. 18. Ghodalagi Vesha During the period from the 6th day of the bright fortnight of Margasira to the 5th day of the bright fortnight of Magha[Basanta Panchami], the deities wear winter clothes. From Basanta Panchami to Dola Purnima, the deities wear modified Ghoda(Winter dress). This vesha is done on any saturday or Wednesday between the new moon day of Magha and Basanta Panchami. “Padma” means lotus. The dress materials made of lotus, “Sola” lace and paper,gum etc. This Vesha is done on the full moon day of Magha. This Vesha depicts a story in the puranas as to how Lord Vishnu saved an elephant from the attack of an Alligator. Besides these, there are other veshas like Shradha and Chacheri veshas are done in the month of Margasira and Falguna respectively. The sevaks of temple who dress the deities with clothing and flowers are known as Puspalaks or Singharis. Elaborate preparations start months before the festival day. 150 carpenters work for a two-month period on building the three huge chariots – one for each of the three deities. 20 sculptors then create the intricate wood carvings which decorate the chariots. The chariots are painted in bright colours and decorated with appliqué work. A whopping 8 million rupees (145,000EUR / 210,000CAD / 198,000USD) are spent on the preparations for the event. Every year approximately 700,000 devotees from all over India and different parts of the world come to Puri on July 16th to witness the Rath Yatra. This is the only time of the year that non-Hindus have the chance to catch a glimpse of Lord Jagannath [as they’re not allowed into his temple] As Jagannath is a manifestation of Lord Krishna, this is a particularly important event for Hare Krishna devotees.